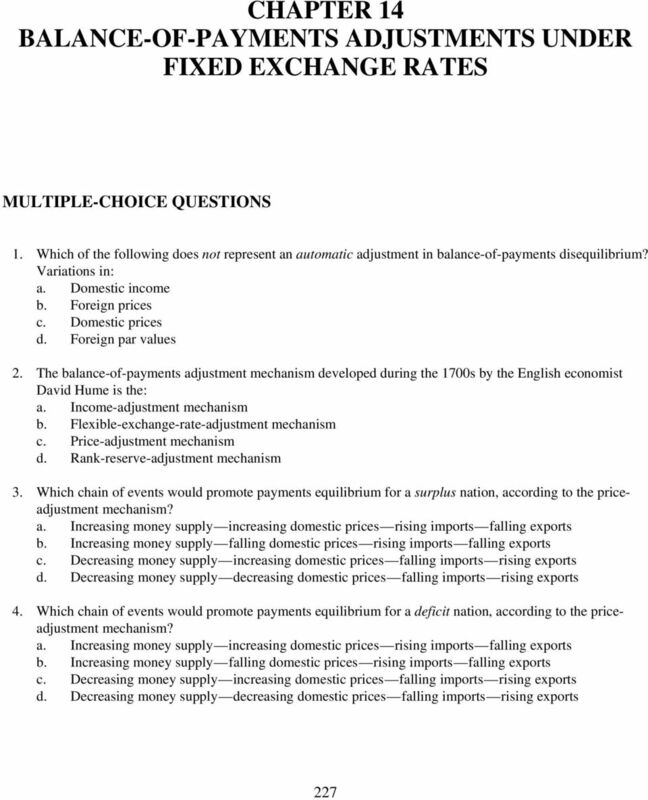 Download "CHAPTER 14 BALANCE-OF-PAYMENTS ADJUSTMENTS UNDER FIXED EXCHANGE RATES"
10 236 Test Bank for International Economics, 9e 48. Refer to Figure Starting at equilibrium income $50 billion, where (S I) 0 intersects (X M) 0, suppose that increased thriftiness leads to an autonomous increase in Australian saving of $5 billion. 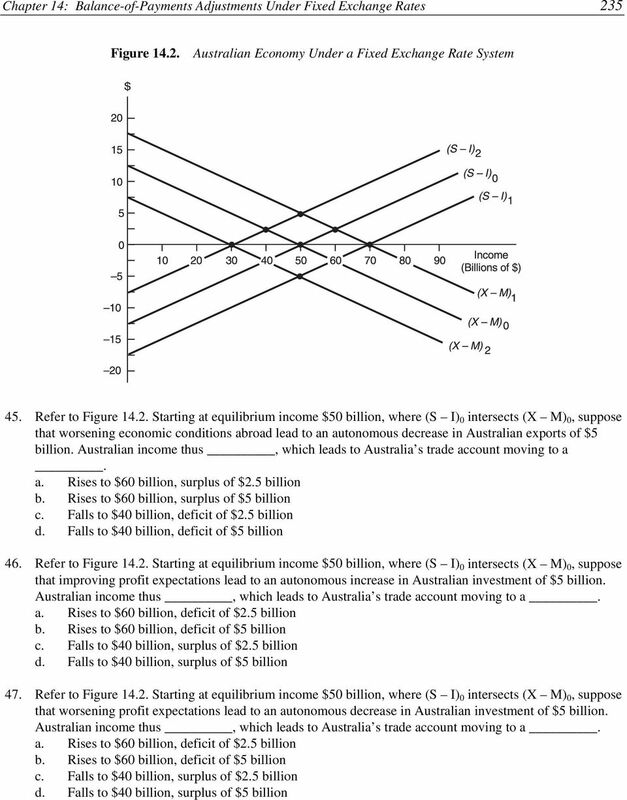 Australian income thus, which leads to Australia s trade account moving to a. a. Rises to $60 billion, deficit of $2.5 billion b. Rises to $60 billion, deficit of $5 billion c. Falls to $40 billion, surplus of $2.5 billion d. Falls to $40 billion, surplus of $5 billion 49. Refer to Figure Starting at equilibrium income $50 billion, where (S I) 0 intersects (X M) 0, suppose that dwindling thriftiness leads to an autonomous decrease in Australian saving to $5 billion. Australian income thus, which leads to Australia s trade account moving to a. a. Rises to $60 billion, deficit of $2.5 billion b. Rises to $60 billion, deficit of $5 billion c. Falls to $40 billion, surplus of $2.5 billion d. Falls to $40 billion, surplus of $5 billion 50. Refer to Figure Starting at equilibrium income $50 billion, where (S I) 0 intersects (X M) 0, suppose that changing preferences lead to an autonomous increase in Australian imports of $5 billion. Australian income thus, which leads to Australia s trade account moving to a. a. Rises to $60 billion, surplus of $2.5 billion b. Rises to $60 billion, surplus of $5 billion c. Falls to $40 billion, deficit of $2.5 billion d. Falls to $40 billion, deficit of $5 billion 51. Refer to Figure Starting at equilibrium income $50 billion, where (S I) 0 intersects (X M) 0, suppose that changing preferences lead to an autonomous decrease in Australian imports of $5 billion. Australian income thus, which leads to Australia s trade account moving to a. a. Rises to $60 billion, surplus of $2.5 billion b. Rises to $60 billion, surplus of $5 billion c. Falls to $40 billion, deficit of $2.5 billion d. Falls to $40 billion, deficit of $5 billion TRUE-FALSE QUESTIONS T F 1. Under a fixed exchange rate system, adjustment mechanisms work for the automatic return to current-account balance after the initial balance has been disrupted. T F 2. When a country s current account moves into disequilibrium, automatic adjustments in tariffs and quotas occur which move the current account back into equilibrium. T F 3. Prices, interest rates, and income are the automatic adjustment variables that help restore current-account equilibrium under a system of fixed exchange rates. 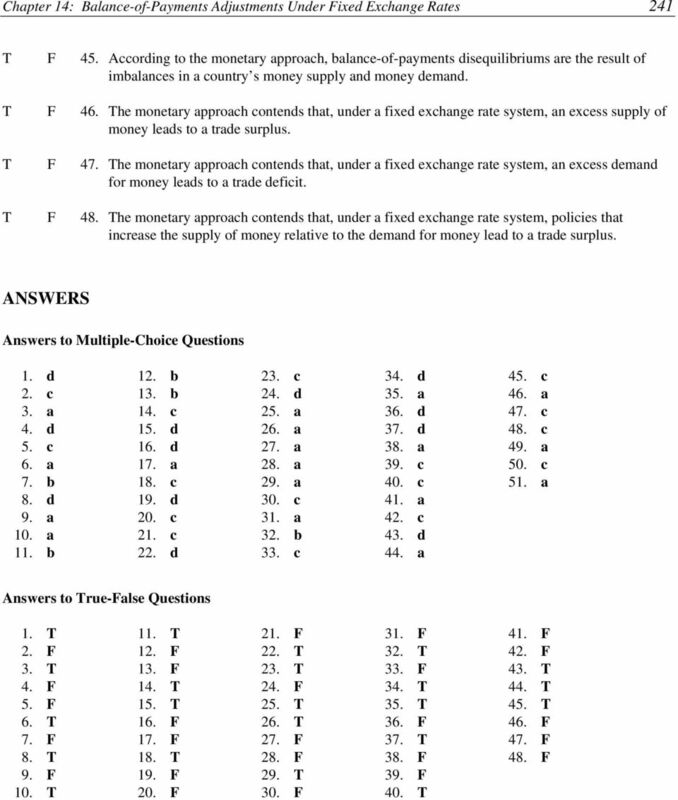 11 Chapter 14: Balance-of-Payments Adjustments Under Fixed Exchange Rates 237 T F 4. That the balance of payments could be adjusted by prices and interest rates, under a fixed exchange rate system, originated with Keynesian theory during the 1930s. T F 5. David Hume s price-adjustment mechanism supported the mercantilist view that a nation could maintain a trade surplus indefinitely. T F 6. Under the price-adjustment mechanism, a government s efforts to maintain a current-account surplus is self defeating over the long run because a nation s current account automatically moves toward equilibrium. T F 7. Under the gold standard of the 1800s, exchange rates were allowed to float freely in the currency markets. T F 8. 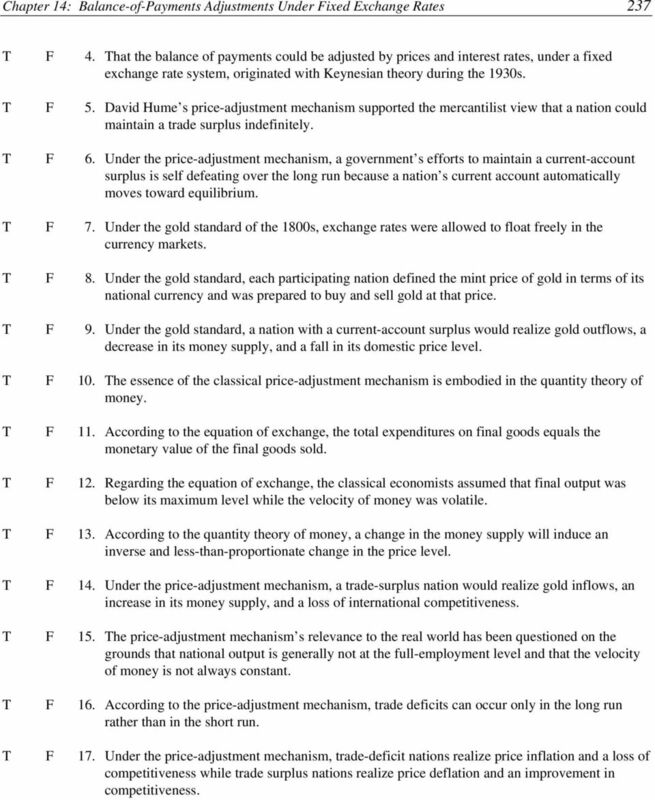 Under the gold standard, each participating nation defined the mint price of gold in terms of its national currency and was prepared to buy and sell gold at that price. T F 9. Under the gold standard, a nation with a current-account surplus would realize gold outflows, a decrease in its money supply, and a fall in its domestic price level. T F 10. The essence of the classical price-adjustment mechanism is embodied in the quantity theory of money. T F 11. According to the equation of exchange, the total expenditures on final goods equals the monetary value of the final goods sold. T F 12. Regarding the equation of exchange, the classical economists assumed that final output was below its maximum level while the velocity of money was volatile. T F 13. According to the quantity theory of money, a change in the money supply will induce an inverse and less-than-proportionate change in the price level. T F 14. Under the price-adjustment mechanism, a trade-surplus nation would realize gold inflows, an increase in its money supply, and a loss of international competitiveness. T F 15. The price-adjustment mechanism s relevance to the real world has been questioned on the grounds that national output is generally not at the full-employment level and that the velocity of money is not always constant. T F 16. According to the price-adjustment mechanism, trade deficits can occur only in the long run rather than in the short run. T F 17. Under the price-adjustment mechanism, trade-deficit nations realize price inflation and a loss of competitiveness while trade surplus nations realize price deflation and an improvement in competitiveness. 12 238 Test Bank for International Economics, 9e T F 18. Under the classical gold standard, adjustments in domestic prices and short-term interest rates automatically promoted balance-of-payments equilibrium over the long run. T F 19. Under the classical gold standard, a trade surplus nation would realize gold inflows, an increase in its money supply, rising interest rates, and net investment inflows. T F 20. The gold standard s rules of the game required central bankers in a surplus country to initiate contractionary monetary policies which lead to higher interest rates and net investment inflows. T F 21. The gold standard s rules of the game required central bankers in a trade deficit nation to expand the money supply, leading to falling interest rates and net investment outflows. T F 22. The rules of the game served to reinforce and speed up the interest-rate-adjustment mechanism under a system of fixed exchange rates. T F 23. Refer to Figure As U.S. interest rates rise relative to foreign interest rates, the U.S. slides upward along schedule CA 0, thus moving towards capital-account surplus. Figure U.S. Capital Account Under a Fixed Exchange Rate System T F 24. 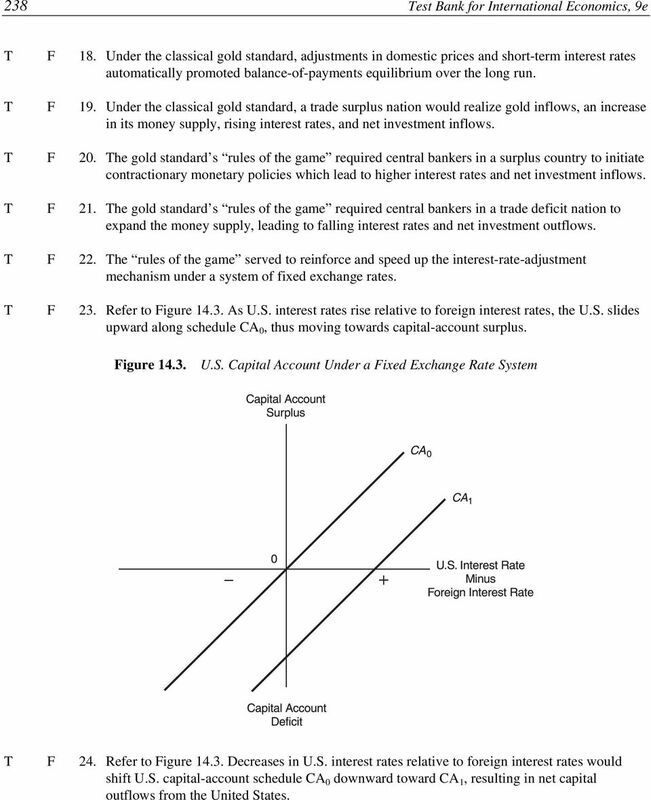 Refer to Figure Decreases in U.S. interest rates relative to foreign interest rates would shift U.S. capital-account schedule CA 0 downward toward CA 1, resulting in net capital outflows from the United States. 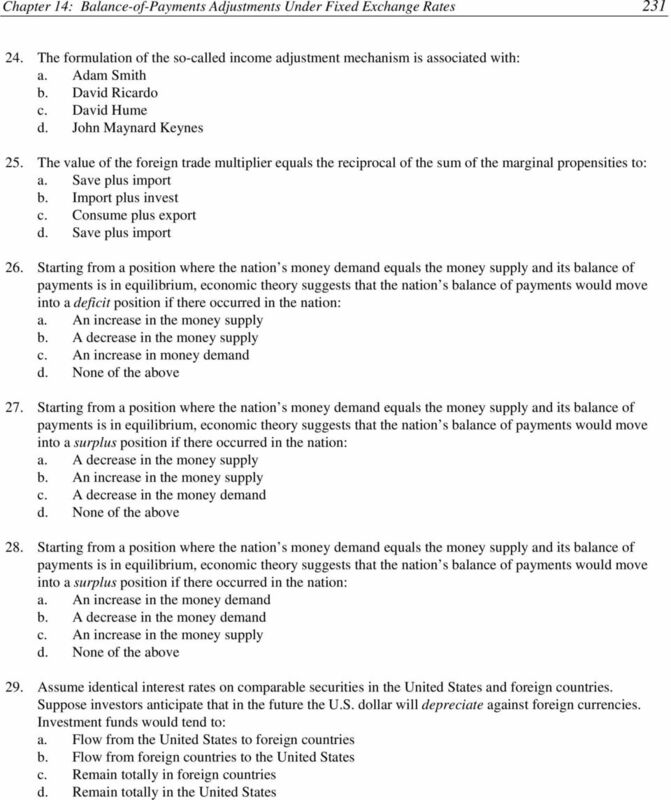 13 Chapter 14: Balance-of-Payments Adjustments Under Fixed Exchange Rates 239 T F 25. Refer to Figure Falling investment profitability in the United States, relative to investment profitability abroad, would shift the U.S. capital-account schedule downward from CA 0 to CA 1, resulting in net capital outflows from the United States. T F 26. Refer to Figure As the U.S. government decreases taxes on income earned by U.S. residents from foreign investments, the U.S. capital-account schedule shifts downward from CA 0 to CA 1 and the United States realizes net capital outflows. T F 27. 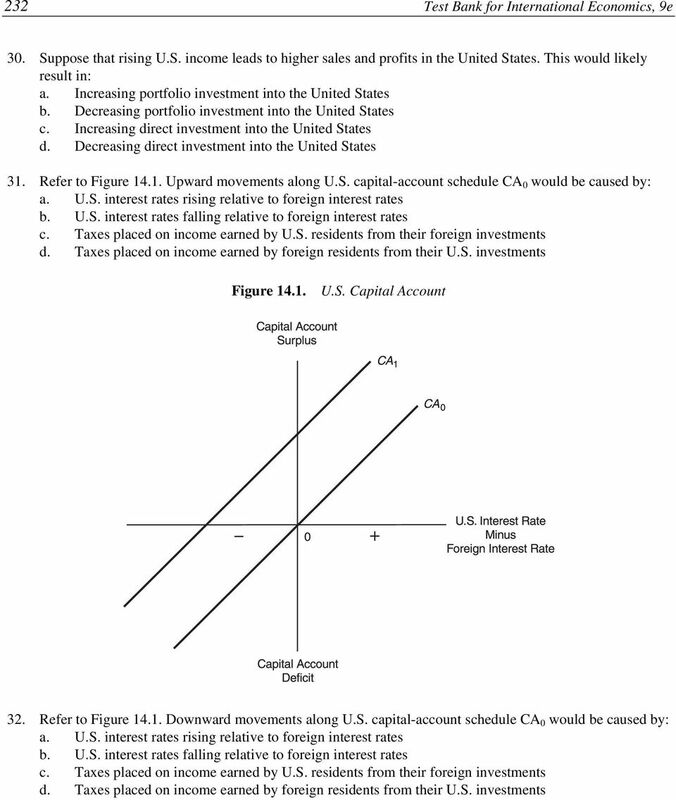 Refer to Figure If the political and economic stability of foreign countries worsens relative to that of the United States, the U.S. capital-account schedule would shift downward from CA 0 to CA 1, resulting in net capital outflows from the United States. T F 28. According to the Keynesian income-adjustment mechanism, income differentials among nations guarantee current-account equilibrium in a world of fixed exchange rates. T F 29. Keynesian theory asserts that, under a system of fixed exchange rates, the influence of income changes in surplus and deficit countries will automatically promote current-account equilibrium. T F 30. The Keynesian income-adjustment mechanism contends that a trade-surplus nation tends to realize falling income and falling imports, thus accentuating the trade surplus. T F 31. The foreign-trade multiplier equals the sum of the marginal propensity to import and the marginal propensity to save. T F 32. If the marginal propensity to save equals 0.2 and the marginal propensity to import equals 0.3, the foreign-trade multiplier equal 2.0. T F 33. For an open economy subject to international trade, equilibrium income occurs where saving plus investment equals imports plus exports. T F 34. If the marginal propensity to save equals 0.1 and the marginal propensity to import equals 0.3, an autonomous increase in exports of $1,000 would expand domestic income by $2,500 which leads to an increase in imports of $750. T F 35. If the marginal propensity to save equals 0.2 and the marginal propensity to import equals 0.3, an autonomous decrease in investment spending of $1 million leads to a $2 million decrease in domestic income and a $600,000 decrease in imports. T F 36. For the income adjustment mechanism to reverse a trade deficit, economic policymakers must be willing to permit domestic income to increase which leads to rising imports. T F 37. Reliance on an automatic adjustment process tends to be unacceptable in trade-deficit nations since it requires them to accept price deflation and/or falling income as a cost of reducing imports. 14 240 Test Bank for International Economics, 9e T F 38. An automatic adjustment mechanism would require a trade-surplus nation to accept price deflation and/or falling income as the cost of increasing imports. T F 39. 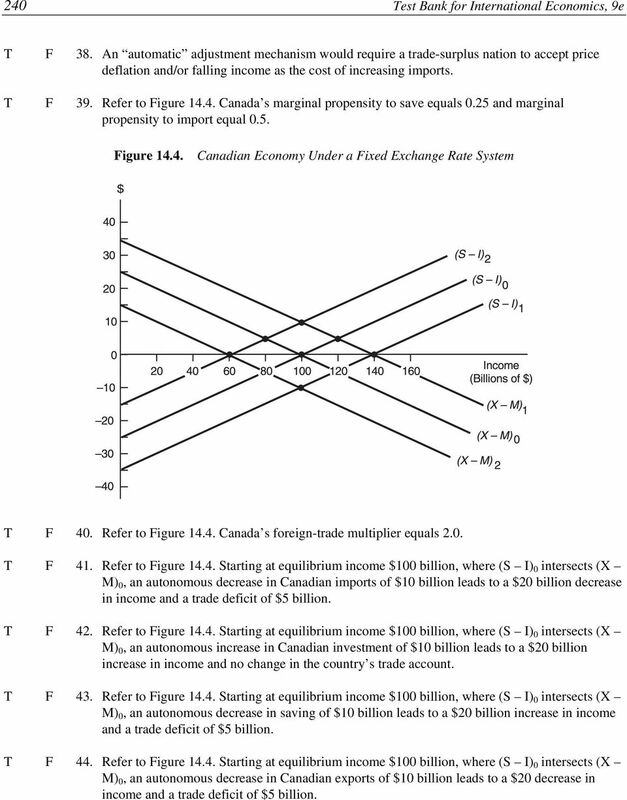 Refer to Figure Canada s marginal propensity to save equals 0.25 and marginal propensity to import equal 0.5. Figure Canadian Economy Under a Fixed Exchange Rate System T F 40. Refer to Figure Canada s foreign-trade multiplier equals 2.0. T F 41. Refer to Figure Starting at equilibrium income $100 billion, where (S I) 0 intersects (X M) 0, an autonomous decrease in Canadian imports of $10 billion leads to a $20 billion decrease in income and a trade deficit of $5 billion. T F 42. 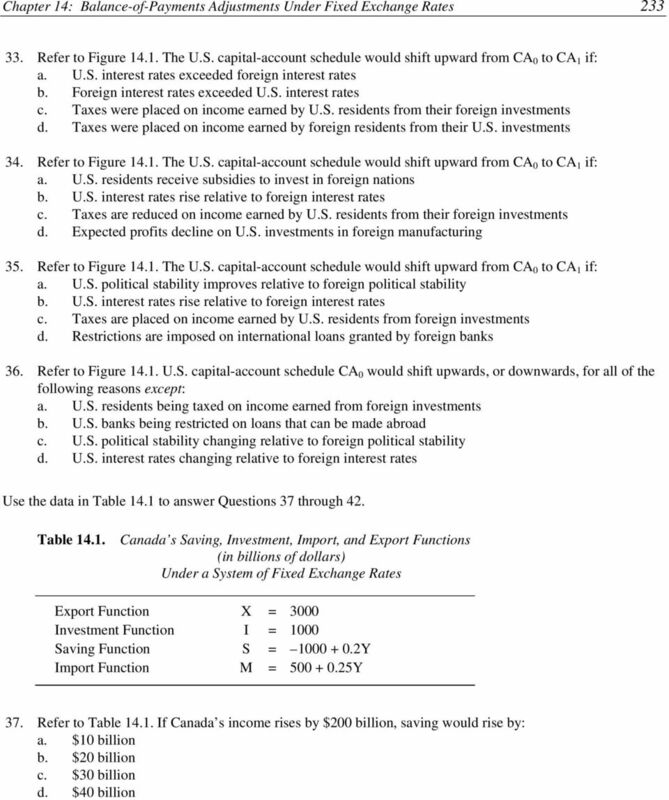 Refer to Figure Starting at equilibrium income $100 billion, where (S I) 0 intersects (X M) 0, an autonomous increase in Canadian investment of $10 billion leads to a $20 billion increase in income and no change in the country s trade account. T F 43. Refer to Figure Starting at equilibrium income $100 billion, where (S I) 0 intersects (X M) 0, an autonomous decrease in saving of $10 billion leads to a $20 billion increase in income and a trade deficit of $5 billion. T F 44. 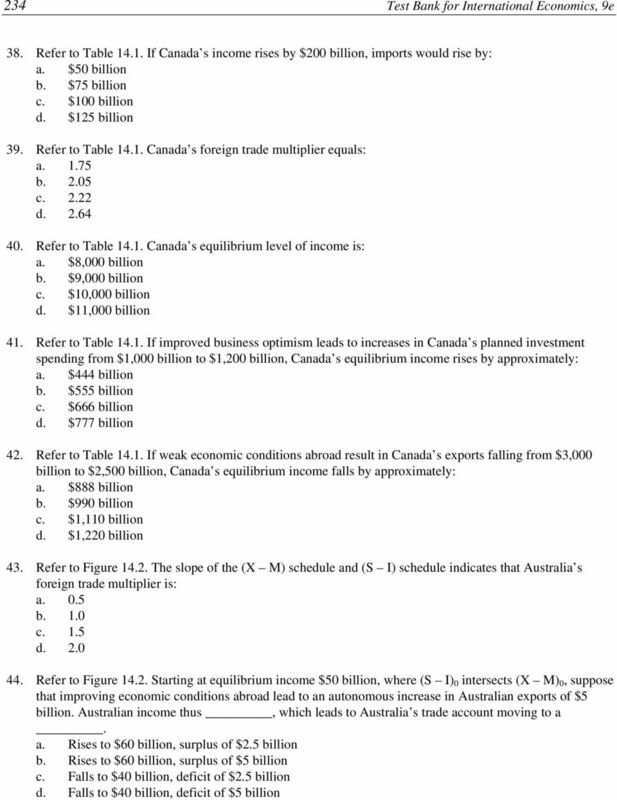 Refer to Figure Starting at equilibrium income $100 billion, where (S I) 0 intersects (X M) 0, an autonomous decrease in Canadian exports of $10 billion leads to a $20 decrease in income and a trade deficit of $5 billion. ASSIGNMENT 1 ST SEMESTER : MACROECONOMICS (MAC) ECONOMICS 1 (ECO101) STUDY UNITS COVERED : STUDY UNITS 1 AND 2. DUE DATE : 3:00 p.m.
3. Define the multiplier. How is it related to real GDP and the initial change in spending? How can the multiplier have a negative effect? 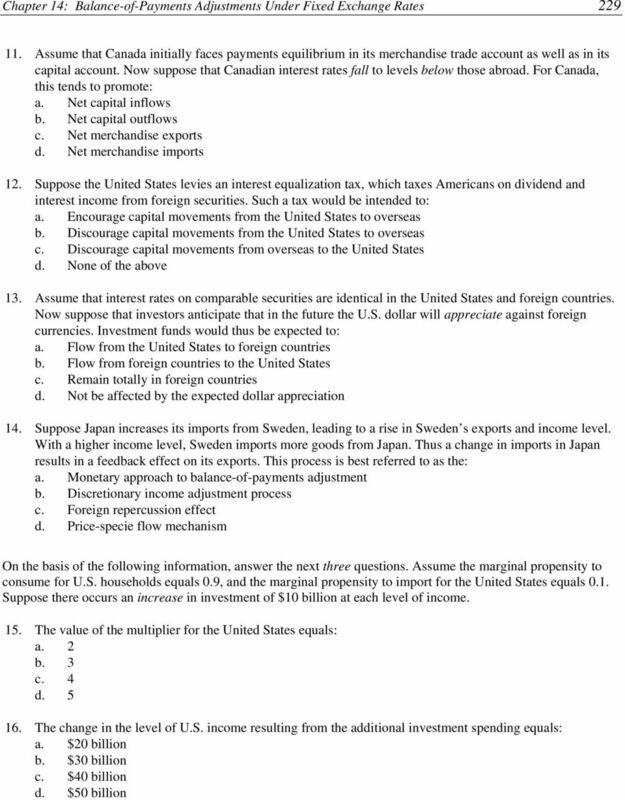 These are some practice questions for CHAPTER 22. Each question should have a single answer. But be careful. There may be errors in the answer key! AP Macroeconomics: Vocabulary. 1. Aggregate Spending (GDP): The sum of all spending from four sectors of the economy.
. consumption and investment spending. The Fiscal Policy and The Monetary Policy. Ing. 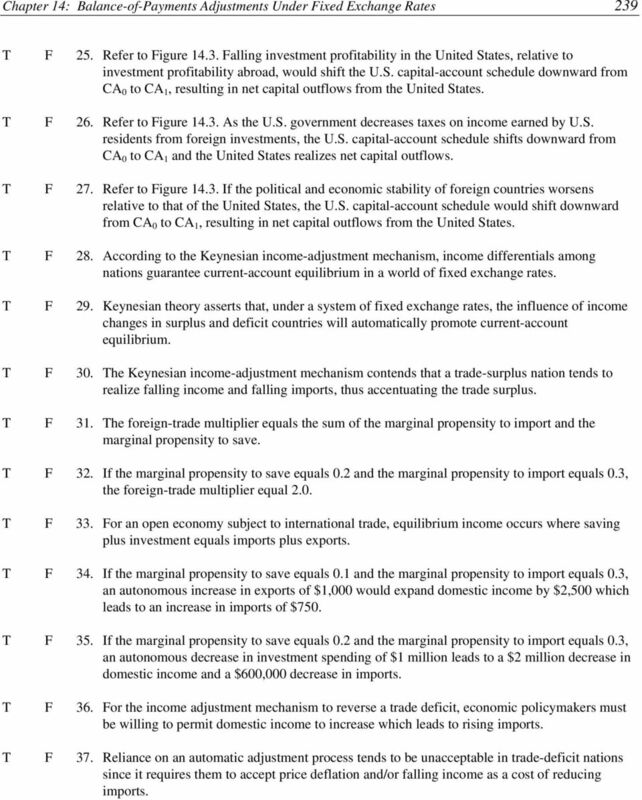 Mansoor Maitah Ph.D.
Keynesian Fiscal Policy Practice Test Multiple Choice (13 marks) - - - - - - - - - - - - - - - - - - - - - - - - - - - - - - Fiscal Policy - - - - - - - - - - - - - - - - - - - - - - - - - - - - - - 1. We have rationalized why Classical Economist believe that Governments have no role in the Economy. This segment of our Macroeconomic Analysis will rationalize why Keynesian Economist believes otherwise.